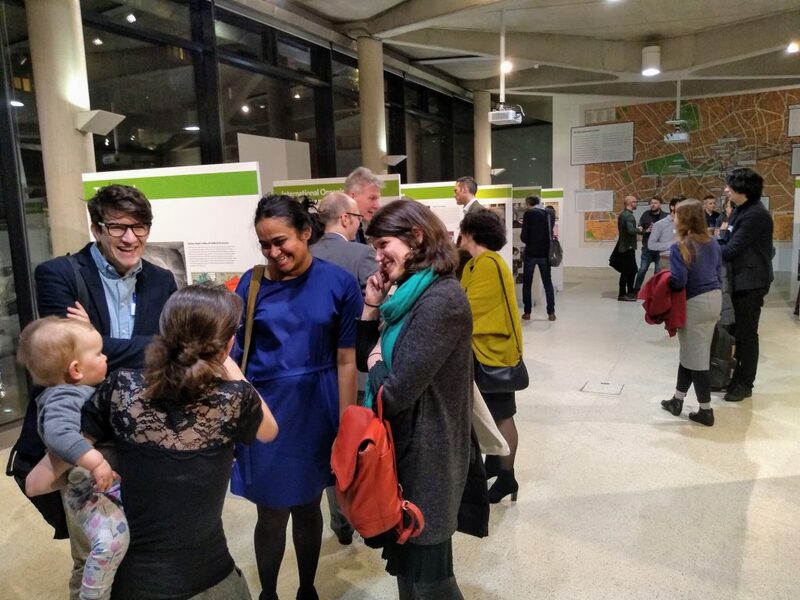 On Tuesday 18th and Wednesday 19th December, we met for what was the primary public event of the ‘Conferencing the International’ project: an international conference on international conferencing. The venue was the Royal Geographical Society (with IBG) in South Kensington, London, a space whose own overtly imperial history and decoration, which the geographers in attendance had grown accustomed to, was being encountered for the first time by the equal number of non-geographers, including those based in departments of history, international relations, architecture, cultural studies, language studies and education studies. All were warmly welcomed by the Director of the RGS-IBG, Professor Joe Smith, whose comments on the Society’s role called to mind Mike Heffernan’s lecture the previous week on its history as both an actor in and site of internationalism. The first session of the conference was organised around the loose theme of ‘science and knowledge’. To kick us off, Martin Mahony spoke to the title ‘Conferencing the aerial future’, looking at how imperial and meteorological conferences had contributed to understandings of atmospheric mobility, and at the physical role of networks of airship communication in embodying and performing this international mobility. Jessica Reinisch then discussed her exciting new project that promises to look at the history of transnational scientific conferences, and their influence in shaping how conferences were thought of and conducted. Finally, Dan Clayton and Hannah Fitzpatrick spoke about the international conferences organised by the Institute of Pacific Relations, looking at how the subject of the post-war reconstruction of Japan shed light on the way in which these conferences operated as dynamic spaces in which certain ideas and narratives could take shape. After a brief break, we reconvened for the second session of the day, ‘post-colonial conferencing’. The first speaker, Naoko Shimazu, could not be there in person, and so participated via Skype. Regrettably the less than perfect connection exposed the limitations that still afflict videoconferencing, but Naoko overcame these issues to deliver her fascinating paper ‘Conferencing Women at Bandung in 1955’, in which she argued that by shifting focus to the ‘informal diplomacy’ at the conference, the impression of a wholly male conference gives way to a picture of many women present in various capacities. 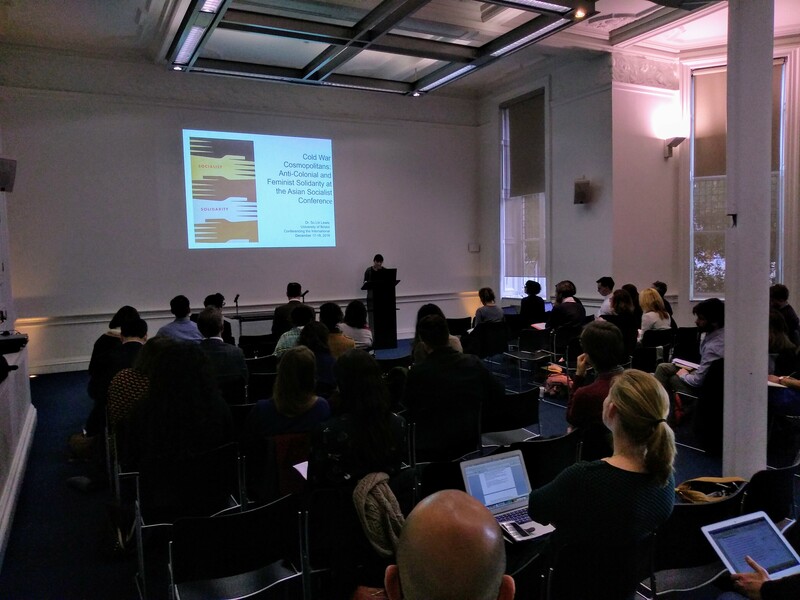 Next, Jo Crow spoke about the 1940 and 1948 Inter-American Conferences on Indian Life, and the ways in they operated as spaces in which issues of indigeneity were negotiated, both above and below the surface. Su Lin Lewis (above) then shared some of her research on the Rangoon (1953) and Bombay (1956) Asian Socialist Conferences, including spectacular visualisations of the networks that these conferences created. Carolien Stolte took as her case study the 1955 New Delhi Conference of Asian Countries on the Relaxation of International Tension, speaking to many of the themes that had emerged in the session, including the blurring of the lines between state and non-state politics and the collision of global and local concerns at such conferences. After a delicious lunch platter in the Main Hall of the RGS, the day’s third session turned to the topic of ‘international organisations’. First up was Wouter Van Acker, who discussed what he termed the ‘international congress-exhibition complex of the urban internationale’, and the way in which urban expertise was constructed through this complex. Daniel Laqua spoke about his research on the Union of International Associations, whose raison d’être, being an international organisation interested in international organisations (in the 1910s and 20s), certainly befit an international conference on international conferences! Using this Brussels-based organisation as a case study, Daniel showed how these internationalisms were grounded in specific contexts, and suggested that we think critically about how we use the paper trail that such organisations created. Catherine Gibson’s paper, meanwhile, took us behind the scenes at the Paris Peace Conference, where representatives from Estonia and Latvia used informal tactics to insert themselves into the conference agenda, circulating their business cards, pamphlets and maps among the assembled delegates. Finally, Mike Heffernan looked at the 1937 International Studies Conference in Paris, and the ways in which it reflected the tensions within the Paris Exposition internationale that it had been timed to coincide with. The day’s talks concluding with our first keynote, Brian Vick (above), who provided a longer historical context to conferencing. 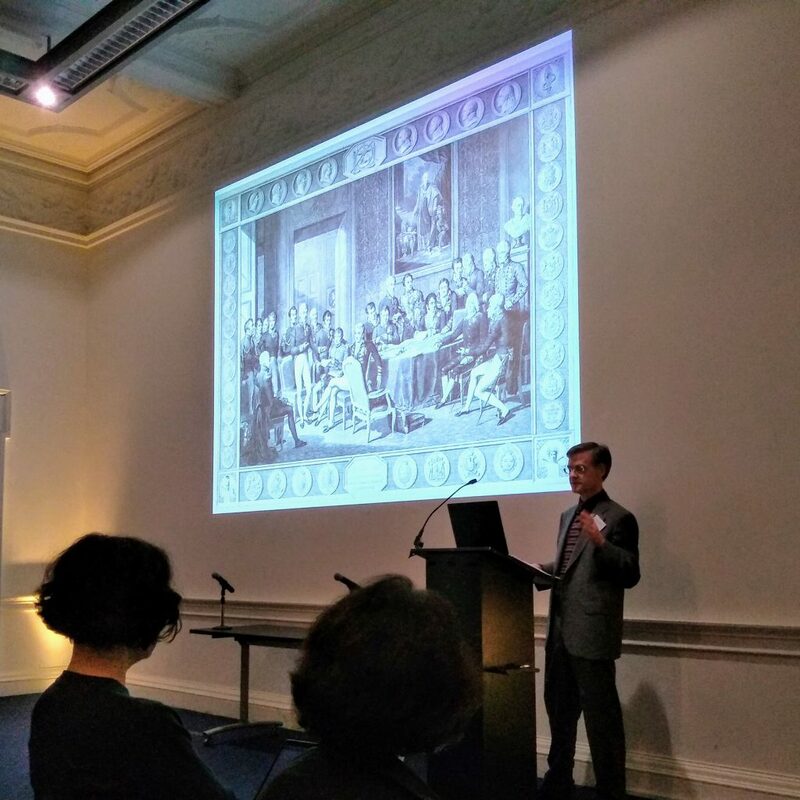 Drawing on his work on the 1814-15 Congress of Vienna, Brian examined the role of ambassadorial conferences, arguing that international diplomacy had developed a public presence prior to the late nineteenth- and early twentieth-century proliferation of international organisations. After Brian’s talk we moved from the Education Centre through to the Exhibition Pavilion for well-earned refreshments amidst our linked exhibition, “Spaces of Internationalism” (below), which had launched the previous evening. This provided a great opportunity to discuss the day’s events and take in the exhibition, many of whose panels resonated with the papers we had just heard (see the online virtual exhibition). The day’s events concluded with a splendid conference dinner across the road in the second-floor Salonik room of ‘Ognisko Polskie’ (the ‘Polish Hearth’), which proved to be not just an appropriately international, but also an exceedingly hospitable venue. The second day began a little later than advertised, as Glenda Sluga had been forced to withdraw. Instead, the day’s first session, on ‘approaching conferences’, began with Stephen Legg’s fascinating paper on ‘Political Atmospherics’. Steve took three cuts on the sensing of ‘atmosphere’ at the Round Table Conferences of 1930-32: the fostering of a certain tenor of debate at the conference, the physical fogginess and cold of a London autumn, and the feelings of futility that came out of the discussions that were held. Iver Neumann focused on just one sense: the role of the visual in international diplomacy, and how the language of the visual is enmeshed in all sorts of tacit and overt layers of meaning. The session’s last paper was given by Wendy Asquith, who encompassed both the visual and the built form in her talk about the League of Nations’s exhibits at the Paris (1937) and New York (1939/40) World’s Fairs. 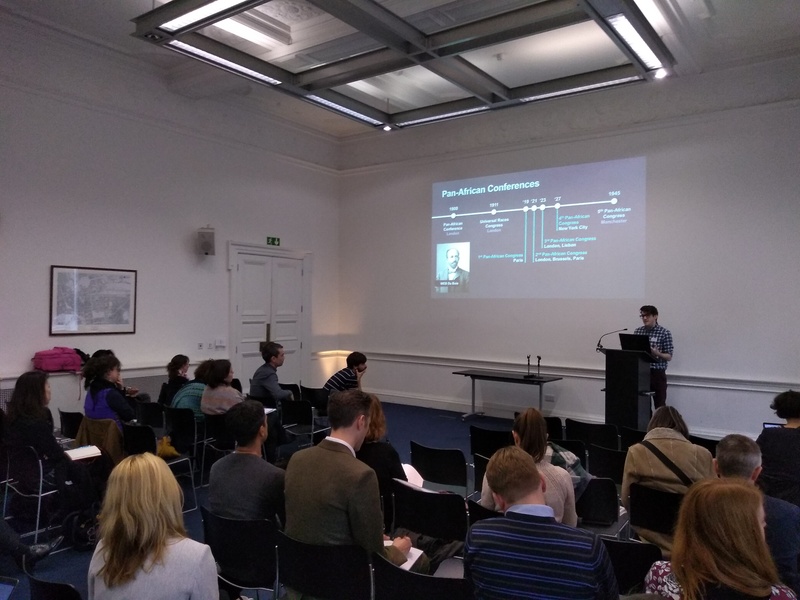 This was followed by the conference’s second keynote lecture, given by Madeleine Herren, who sought to look at conferences ‘beyond the records’: that is, as more than just countable events or collections of delegates. The morning’s theme of visuality was carried forward with discussion of the architecture and imagery through which conferences have been represented, and most fascinatingly, mis-represented. By delving into the epistemology of conferences, and comparing the written with the visual records, Madeleine told the stories of how the invention of conferencing as a new field of expertise attracted chancers and imposters, and asked us to consider whether these stories are incidental or integral to the history of conferencing in the early twentieth century. Since the lecture had so brilliantly discussed the role of conference photographs, we decided that this was an apposite time to assemble at the front of the hall for our own conference photo (below)! After another great lunch spread, the day’s second full session dealt with ‘conferencing decolonisation’. Ruth Craggs began with her paper on international geography conferences in the post-WWII period, and in particular the African geographers that hosted and attended these conferences, and the forms of mobility that these conferences offered them. Jake Hodder (below) took us back to the interwar period, and the Pan-African Congresses that were held in Paris (1919), London/Brussels/Paris (1921), London/Lisbon (1923) and New York City (1927). Picking up Madeleine Herren’s theme of the epistemology of conferences, Jake took us through the surprisingly slippery basic details of the Congresses, and raised intriguing questions about how the very malleability of these details tells its own story about the Pan-African movement. Marc Matera picked up the threads of Pan-Africanism in his account of two conferences, the 1945 ‘Pan-African Congress’ in Manchester and the 1946 ‘Conference on the relationship between the British and Colonial Peoples’ in Clacton-on-Sea, highlighting the overlaps and tensions between the two events. Finally, Pete Docking looked at the 1960-64 ‘African Decolonisation Conferences’ held in London, both from the perspective of the African delegates’ tactical use of these conferences, and the London hosts’ attempts to convey certain impressions though their own equally tactical choices of venue. The conference’s final session took ‘contemporary conferencing’ as its subject. First, we heard from Tony Rogers, a consultant specialising in conferences, on the trends and changes that have marked the organisation of international conferences in recent decades, and the factors that govern the decisions and efforts of both conference organisers and host cities. Emily Henderson, one of the editors of the Conference Inference blog, then took us through her work on contemporary academic conferences, and the often troubling political economy of access and participation to conferences. Even once access in secured, these inequalities can persist, as Fiona McConnell showed in her analysis of the tactics of bullying and protest at the UN Permanent Forum on Indigenous Issues and Forum on Minority Issues. Lastly, Natasha Aruri and Omar Jabary Salamanca challenged the very layout of our conference room, swapping the podium for chairs amongst the audience as they spoke about their experiences organising the International Critical Geography Group conference in Palestine in 2015, which had attempted to enact critical praxis in the format and fabric of the conference. While our own conference was in many ways a less ambitious proposition, the chance to gather such a diverse group of voices around what at first appeared a fairly narrow central theme felt incredibly rewarding. Indeed, each paper offered a distinct perspective on the history and geography of international conferences, and it was a privilege not to be faced with the dilemma of competing sessions, and for post-paper questions (and indeed break-times) to involve all the conference delegates, as well as the very attentive audience (one that happily featured several familiar faces).